A traditional Slovak Easter Cheese served with the Easter meal. This is served sliced and cold. It tastes like a sweet custard. In an electric mixer, beat the eggs until mixed well. Transfer the eggs to a double boiler and stir in milk, sugar, vanilla and nutmeg. Cook over a medium heat for 30 minutes. Use a metal slotted spoon and constantly stir the bottom of the pan to prevent scorching. When the mixture looks just like cooked scrambled eggs, pour it carefully into a cheesecloth-lined colander. 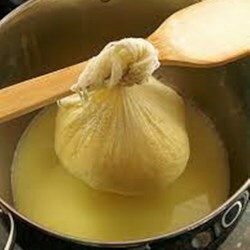 Carefully gather the ends of the cheesecloth in your hands and pull them together until the cheese forms into a ball. Tie the cheesecloth tightly at the top of the ball. Tie the cheesecloth ends over a faucet or to the handle of a kitchen cabinet (place a bowl under to catch the whey dripping down) and let hang for about 3 hours. Untie the cleesecloth and wrap the cheesecloth ball in plastic wrap before refrigerating. The cheese will keep for about a week. Slice and serve.